This week at CES, Kymeta announced a partnership with Panasonic to bring lightweight, flat-panel antennas to the maritime market. Kymeta’s core technology, the mTenna, is designed to communicate with satellites in order to bring high speed internet to anything on the move. The partnership will allow Kymeta to leverage Panasonic’s satellite network as well as their current maritime customer base, which includes owners of yachts, merchant vessels, cruise ships, and other vessels. Panasonic has agreed to order a “significant volume” of mTennas to manufacture and distribute for vessels around the world. The mTenna would replace larger and more complex antenna options in the maritime market. Traditionally, an antenna for a vessel requires weeks of downtime to install. The current technology also requires moving parts which means a noisier antenna with more wear and tear. One of the unique innovations in the mTenna is its ability to use software to electronically acquire signals with no moving parts. However, the mTenna isn’t ready for commercial use just yet. More work is required to perfect this new technology and prove its capabilities. Prototype testing of the antenna and terminal specifically for maritime use will begin this year and will become commercially available in 2017. 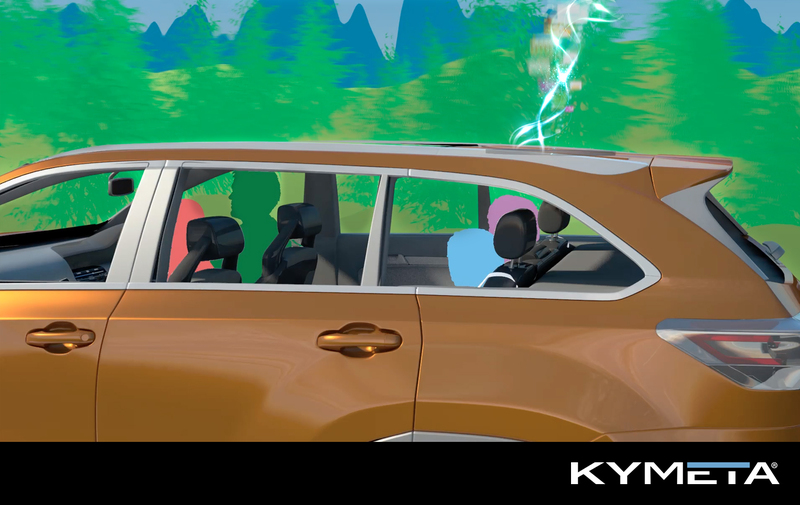 The partnership comes shortly after Kymeta revealed successful results from a mobility test, which analyzed the on-the-go functionality of the mTenna on the roof of a car over the course of 8,000 miles. The test also proved that the mTenna was capable of communicating with Ku-band satellites, whereas previously the antenna had just been tested with Ka-band satellites. This distinction is important because while some satellite operators (potential Kymeta partners) may work with both types of satellites, others will only operate in one band or the other. Panasonic, for example, uses a global Ku-band satellite network which can provide internet, television, and mobile phone services to planes, ships, and those in remote locations. What’s interesting about this partnership is that Panasonic already offers a Ku-band antenna (albeit for airplanes) to communicate with its satellite network. Their eXConnect antenna, currently used to provide internet for United airplanes, is thicker and larger than Kymeta’s mTenna. The eXConnect technology is also inherently different. It uses motors to steer the antenna and catch a satellite signal whereas the mTenna uses software to electronically communicate with satellites. With a smaller, lighter frame and no moving parts, the mTenna is a large improvement over Panasonic’s existing options. If, for example, Kymeta partnered with another company to provide internet to the maritime market, Panasonic may not have been able to compete with the mTenna’s patented technology. In addition to maritime vessels, Kymeta’s technology could bring Internet to planes and cars. Kymeta told TechCrunch that another key partnership related to the automobile market will be announced next week. There’s certainly a lot of promise associated with the mTenna. To deliver on those promises, Kymeta will need strategic partnerships with satellite operators and various manufacturers in addition to proving out their technology. To date, the partnership with Panasonic has been Kymeta’s most significant step toward achieving these goals and bringing the mTenna to market.